The display presents a map-like picture of the terrain below and around the aircraft. Just as map reading skill is largely dependent upon the ability to correlate what is seen on the ground with the symbols on the chart, so the art of scope presentation analysis is largely dependent upon the ability to correlate what is seen on the scope with the chart symbols. Application of the concept of radar reflection and an understanding of how received signals are displayed on the display are prerequisites to scope interpretation. Furthermore, knowledge of these factors applied in reverse enables the navigator to predict the probable radarscope appearance of any area. The greatest return potential exists when the radar beam forms a horizontal right angle with the frontal portion of the reflector. Radar return potential is roughly proportional to the target size and the reflective properties (density) of the target. Radar return potential is greatest within the zone of the greatest radiation pattern of the antenna. Radar return potential decreases as range increases because of the greater beam width at long ranges and because of atmospheric attenuation. Figure 7-5. 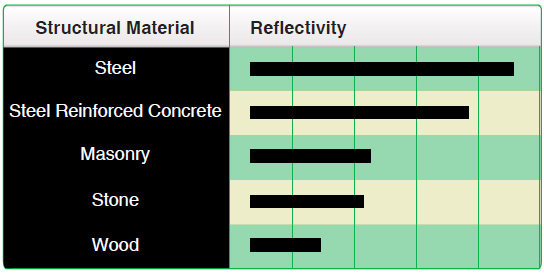 Relative reflectivity of structural materials. NOTE: All of the factors affecting reflection must be considered to determine the radar return potential.